With his gaunt face and slight frame, this Hull-born, RADA -trained actor represented for a generation of filmgoers resistance to the status quo. Unlike his burlier Angry Young Men contemporaries, Albert Finney and Alan Bates , Courtenay conveyed his strength through posture, quiet intonation and the expressiveness of his eyes. 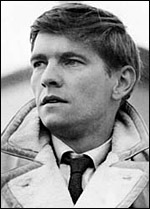 This eloquence, coupled with a regional accent (confronting at the time), proved a powerful combination in his signature role in The Loneliness of the Long Distance Runner (d. Tony Richardson, 1962), and made him a star of the British New Wave of films tackling social problems during the 1960s. However, despite compelling performances in Billy Liar (d. John Schlesinger, 1963), King and Country (d. Joseph Losey, 1964), and the epic Doctor Zhivago (d. David Lean, 1965), when the decade closed and the wave had ebbed, Courtenay 's star status diminished. During the next decade he concentrated mainly on the stage, until making a notable return to films in 1983 with The Dresser (d. Peter Yates), playing a prissy, dedicated assistant to a vainglorious stage actor. Courtenay brings wonderful panache to the role he had already performed to great acclaim on the London and Broadway stages, and is at once versatile and moving, and he has devastating moments as the distraught father in Let Him Have It (d. Peter Medak, 1991). He is divorced from stage actress Cheryl Kennedy , who appeared in a few films in the 1970s. He was knighted in 2001.